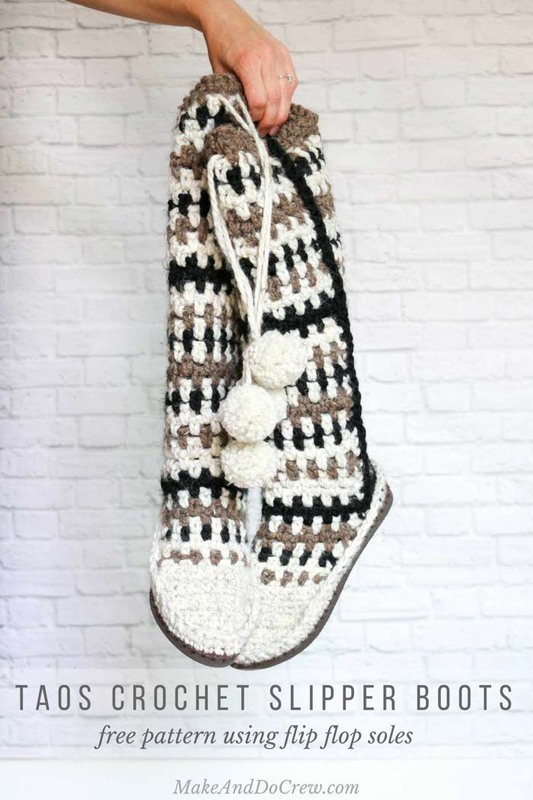 This crochet mukluks free pattern is the perfect treat for your feet this season! Find Part 2 of the pattern below or you can purchase the complete ad-free, printable PDF with hole-poking ruler here. In Part 1 of the free Taos Slipper Boots pattern, we worked created the foundation rounds on the flip flop sole and worked the front of the mukluks. 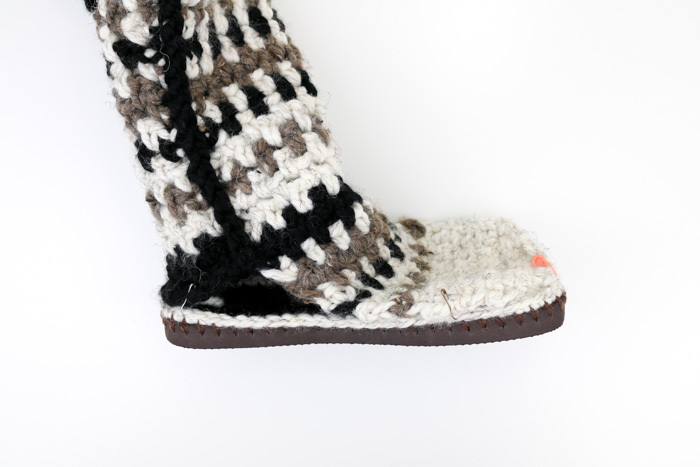 Today, we’ll be crocheting the back of the mukluks, seaming the two pieces together and joining them to the flip flop base. In fact, if you don’t want to use flip flops for your soles, you can crochet a simple sole and work the foundation rounds into it as if it was a flip flop. 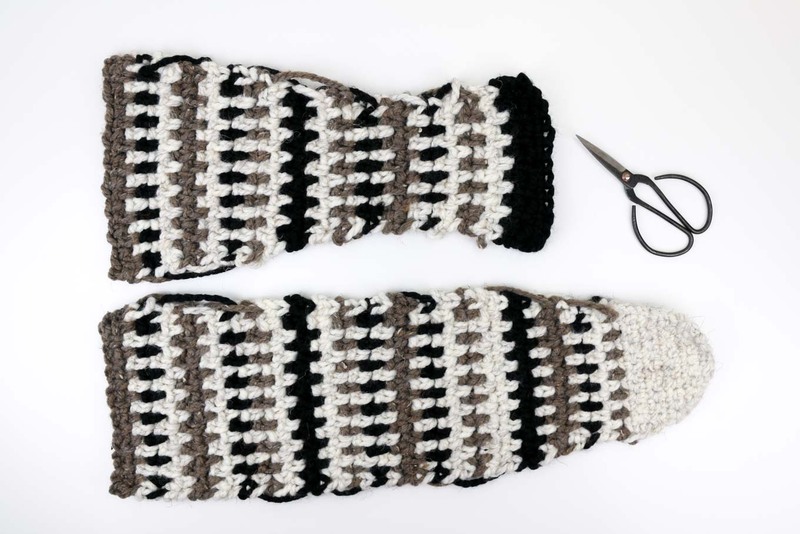 In either case, I think you’ll find these to be a quick, cozy and super satisfying project! 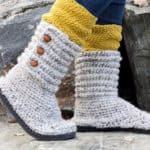 This free crochet mukluks pattern is part of a collaboration with my friends at Lion Brand yarn. This p0st contains affiliate links. Please do not publish or share this pattern as your own. You may make items to sell with this pattern. In exchange, please link back to this post and do not use my photos as your own sales photos. Now go make something awesome! Purchase the ad-free, printable PDF with hole poking ruler guide for $2.75 here. Find Part 1 of the Taos Crochet Mukluks here. So you can spend more time making mukluks and less time shopping, this pattern contains affiliate links at no extra cost to you. Pattern can be used to make a women’s shoe size 5-10. Notes are included throughout on customizing specific sizing. Foundation: With size N hook and Color C, ch 14. Row 32 (RS): With Color C, repeat Row 3. Row 33 (WS): With Color A, repeat Row 4. Row 34 (RS): With Color B, repeat Row 3. Row 35 (WS): With Color B, repeat Row 4. With right sides facing out, use stitch markers to pin the “top” of the boot to the “back” of the boot. Take care to align each stripe. Attach Color C to the point where the back and top pieces meet. Use size L hook. Seam Row: Ch 1, sc along edge, working at the frequency that gives you the smoothest looking seam. • This section can make or break the look of your boots. If you’re not happy with your first attempt, just rip it out and try again! 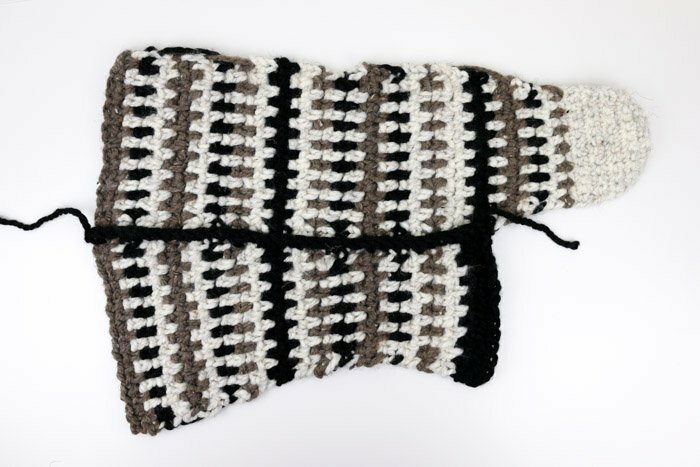 • Right-handed crocheters, work around the sole counter clockwise. Left-handed crocheters, work around the sole clockwise. Use stitch markers to pin the boot onto the flip flop base. I find it easiest to pin the toe and the heel sections first and then accommodate whatever is left in the middle. If you do find that there’s a little extra fabric, try to absorb the excess in the middle of the boot where the top/back seams meet. Attach Color A at 6:00 position. Use size L hook. Seam Round: Ch 1, sc around sole working into the main boot pieces and Round 1 of the boot base, sl st to join. Optional: If you plan to wear your new slippers out in the elements, glue the flip flop toe plug back into place in the toe using a glue like E6000. Use either a pom pom maker or a piece of cardboard to create four pom poms in Color A. Cut two 24” strands of Color A to create the laces. Thread one lace through the ch1sps where Color A and Color B meet at the top of the boots. Thread a tapestry needle onto the lace. Insert tapestry needle into middle of one pom pom. Remove needle and tie several knots in the lace right below where you want the pom pom placed. Pull knot so that it’s absorbed into the pom pom and cut excess strand of yarn. Repeat with a second pom pom on the other side of the of the lace. 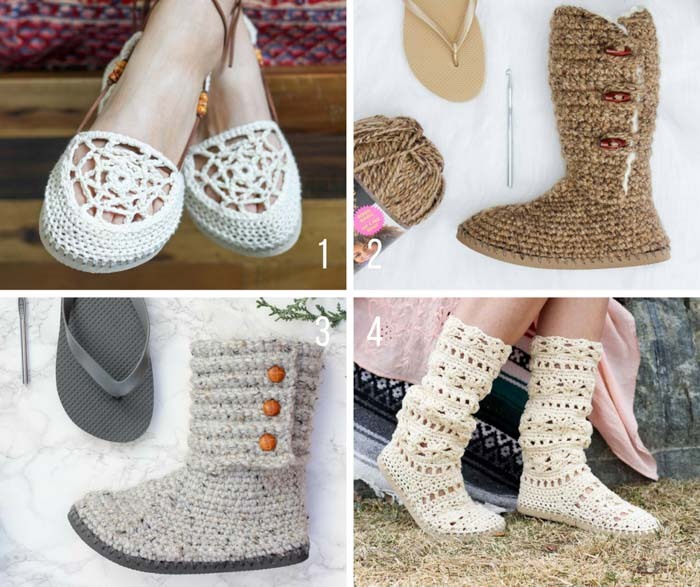 Proudly pull on your new crochet mukluks–you’re now ready for an ice fishing trip, an artic storm, or just a cozy night spent crocheting by the fireplace! These are beautiful!! If you don’t mind me asking, how much did the yarn cost? I am going to put the materials on my Christmas list, and I want to make sure I can save up to buy more. Love the pattern but would like to know how it would work on a wedge style flip flop. Can you make these with only 1 Colorado or 2?